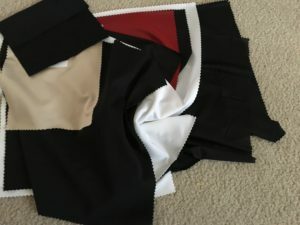 A single needle bed or “V” bed configuration can be used to make circular knit fabrics, the difference being that circular knits, as the name implies, are constructed in tubular form. Circular knits typically use finer yarns, and exhibit soft, supple, conformable and elastic characteristics. Again, applications mostly are fashion- and apparel-related. These include T-shirts, dresses, hosiery, socks, underwear and leggings. Warp-knit fabrics almost always are machine made and can be manufactured at much wider widths than weft knits. 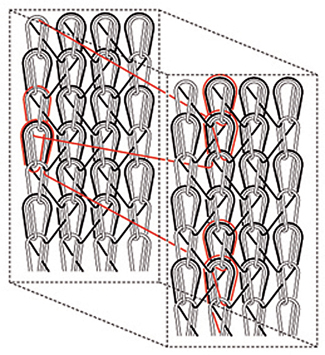 Contrary to weft knits, warp knits are formed as numerous individual strands of yarn — the warp — are guided to select needles in the machine’s flow direction. Warp knit stripes typically run the length of the fabric. Subsequent machine cycles reposition the guided yarn over a different needle to create the warp knit fabric. This interaction of the guided yarn to select needles creates a stable construction that, unlike weft knits, is difficult to unravel. 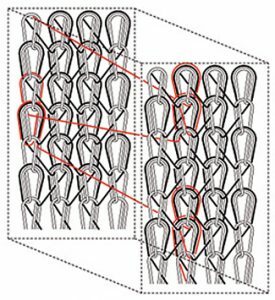 Warp knitting, generally better suited to filament yarns, tends to be more oriented towards applications where engineering, physical properties and high production speeds are most beneficial. This includes some areas of fashion, but the structures also are well suited to industrial, specialty and technical fabric applications.